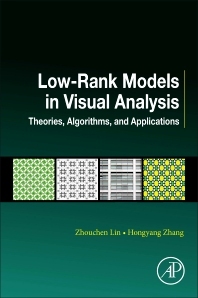 Low-Rank Models in Visual Analysis: Theories, Algorithms, and Applications presents the state-of-the-art on low-rank models and their application to visual analysis. It provides insight into the ideas behind the models and their algorithms, giving details of their formulation and deduction. The main applications included are video denoising, background modeling, image alignment and rectification, motion segmentation, image segmentation and image saliency detection. Readers will learn which Low-rank models are highly useful in practice (both linear and nonlinear models), how to solve low-rank models efficiently, and how to apply low-rank models to real problems. Zhouchen Lin received the Ph.D. degree in applied mathematics from Peking University in 2000. He is currently a Professor at Key Laboratory of Machine Perception (MOE), School of Electronics Engineering and Computer Science, Peking University. His research areas include computer vision, image processing, machine learning, pattern recognition, and numerical optimization. He is an area chair of CVPR 2014/2016, ICCV 2015 and NIPS 2015 and a senior program committee member of AAAI 2016/2017 and IJCAI 2016. He is an associate editor of IEEE Trans. Pattern Analysis and Machine Intelligence and International J. Computer Vision. He is an IAPR fellow. Hongyang Zhang received the Master’s degree in computer science from Peking University, Beijing, China in 2015. He is now a Ph.D. candidate in Machine Learning Department, School of Computer Science, Carnegie Mellon University, Pittsburgh, USA. His research areas include machine learning, statistics, and optimization.